EXCELLENT ART (GB) (Bay 2004-Stud 2008). 4 wins-3 at 2, Royal Ascot St James's Palace S., Gr.1. Sire of 661 rnrs, 404 wnrs, 21 SW, inc. Under the Louvre (BRC Stradbroke H., Gr.1), Lady Lara, Aim to Please, Graphic, Hazel Lavery, Experience, Artistic Jewel, Ruffina, Tropaios, Chase Your Dreams, Meritocracy, Moondancer, Dynamic Lips, Alart, Excilly, Artwork Genie, Artlee, Absolut Excelencia, Lehaaf, Nimohe, Sparkling Portrait, SP French Quebec, etc. ARTLEE (g. by Excellent Art). 6 wins. See below. Marlee Dancer (f. by Marwina). Winner at 1300m in Aust. Chelmsford. 4 wins from 1400m to 1900m, A$105,720, STC Lorimer Semillon Sauvignon Blanc H., 2d AJC Picnic Point H., Lawler Partners Business Advisory Services H., International Passport H., STC Night Races at Canterbury H., 3d AJC Randwick Betting Auditorium H., STC Freeway Republic Beer H.
Fifonella. 2 wins at 1400m in Aust. National Soldier. 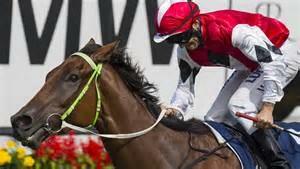 Winner at 1400m, 2d QTC Melbourne Cup Day at Eagle Farm S.
LEND A HAND (Great Commotion). Champion 2YO Colt in Italy in 1997. Champion Older Miler in UAE in 1999. 8 wins-5 at 2-from 1200m to 1600m, £366,579, 30,490fr., 248,200Dhs in GB, Italy and U.A.E, Milan Gran Criterium, Gr.1, Newbury Hungerford S., Gr.3, York Duke of York S., Gr.3, Nad Al Sheba Mile S., L, Doncaster Prince of Wales Cup Nursery H., 2d The Two Thousand Guineas, Gr.1, Deauville Prix Maurice de Gheest, Gr.1, Newmarket Challenge S., Gr.2, Hoppegarten Berlin Brandenburg Trophy, Gr.2, 3d Goodwood Sussex S., Gr.1, Royal Ascot Cork & Orrery S., Gr.2, 4th Breeders' Cup Mile S., Gr.1. Sire. Emirates Champion (Haafhd). 5 wins-1 at 2-from 1600m to 2200m in GB and U.A.E, Meydan Naaqoos H., CBD World Mastercard H., Golf World Cup H., 2d Meydan Ford Edge Trophy, 3d Istanbul Anatolia Trophy, L, Meydan Etisalat My Data Plan H.
Double Deputy. 5 wins from 1¼m to 2¾m, Doncaster Persimmon Homes H., Goodwood Sutton Business Centre S.
LIVEANDLETDIE (Street Cry). 5 wins-1 at 2-at 1000m, 1200m, A$304,255, VRC AR Creswick S., L, Heron Bridge H., Flight Lieutenant Peter Armytage H., 2d VRC Von Costa de Hero 2YO H., 3d VRC James Boag's P., 4th VRC Straight Six H., L, MRC Manfred S., L.
SEA WAVE (Sadler's Wells). 4 wins from 1¼m to 13¼f, £100,697, HK$700,000, York Great Voltigeur S., Gr.2, Newbury Aston Park S., L, 3d Royal Ascot Hardwicke S., Gr.2, Hong Kong Vase, Gr.2, 4th Newmarket Princess of Wales's S., Gr.2. TAMURE (Sadler's Wells). 5 wins from 2000m to 2400m, £264,797, 376,000fr., US$112,000, Longchamp Prix du Prince d'Orange, Gr.3, Newmarket Fred Archer S., L, 2d The Derby, Gr.1, Longchamp Prix du Conseil de Paris, Gr.2. Sire. THREE CHEERS (Slip Anchor). 4 wins from 2800m to 3000m, Longchamp Prix de Lutece, Gr.3, 2d Goodwood Cup, Gr.2, 3d Royal Ascot Gold Cup, Gr.1, Deauville Prix Kergorlay, Gr.2. DUBAWI GOLD (Dubawi). 5 wins-2 at 2-from 6f to 1m, £269,195, €87,445, HK$1,140,000, Goodwood Celebration Mile, Gr.2, Lingfield Spring Cup, L, International Trial S., L, Ascot Hyperion 2YO S., 2d The Two Thousand Guineas, Gr.1, Irish Two Thousand Guineas, Gr.1, Epsom Woodcote S., L, 3d Newbury Lockinge S., Gr.1. D'BAI (Dubawi). 2 wins at 2 in 2016, Pontefract Silver Tankard S., L, 3d Doncaster Champagne S., Gr.2. FORT KNOX (Dubawi). 2 wins-1 at 2-at 6½f, 1m, Leopardstown Two Thousand Guineas Trial, L, 3d Tipperary Concorde S., Gr.3. RICHARD OF YORK (Rainbow Quest). 4 wins-2 at 2-from 1600m to 2400m, Longchamp Prix Foy, Gr.3, Evry Prix Saint-Roman, Gr.3, Longchamp Prix de la Porte de Madrid, L, 2d Ascot Cumberland Lodge S., Gr.3, 3d Longchamp Prix Ganay, Gr.1, Deauville Prix de Reux, L. Sire. MAYSOON (Shergar). 2 wins-1 at 2-at 6f, 7f, £109,448, Newbury Fred Darling S., Gr.3, 2d The One Thousand Guineas, Gr.1, Goodwood Nassau S., Gr.2, 3d The Oaks, Gr.1, York Lowther S., Gr.2, Goodwood Festival S., L. Producer. TREFULA (Rainbow Quest). 4 wins-1 at 2-from 2000m to 2400m, Le Lion-d'Angers Prix Urban Sea, L, 2d Toulouse Prix Panacee, L. Producer. Triagonal (Formidable). 2 wins-1 at 2-at 1m, Sandown Atlanta S., 2d Curragh Gilltown Stud S., Gr.3, Epsom Princess Elizabeth S., Gr.3. Producer. Triple Dancer (Dance in Time). 11 wins from 1800m to 2200m in France and Italy, 2d Auteuil Prix Juigne Hurdle, L, Enghien Prix Leopold d'Orsetti Hurdle, L.
CARLTON HOUSE (Street Cry). 3 wins-1 at 2-from 1m to 10½f, £422,988, €37,500, A$525,000, HK$440,000, York Dante S., Gr.2, Sandown Brigadier Gerard S., Gr.3, 2d ATC Ranvet S., Gr.1, Royal Ascot Prince of Wales's S., Gr.1, ATC Parramatta Cup, L, 3d The Derby, Gr.1, ATC Queen Elizabeth S., Gr.1, 4th Irish Derby, Gr.1. FRISTON FOREST (Barathea). 7 wins-1 at 2-from 1600m to 3000m, £31,098, €179,025, 331,200Dhs in France and U.A.E, Chantilly Prix Scaramouche, L, 3d Longchamp Prix La Force, Gr.3. ZIBELINA (Dansili). 3 wins from 1400m to 1600m, Deauville Prix de Lieurey, Gr.3, Ascot Valiant S., L, 3d Goodwood Conqueror S., L, 4th Sandown Atalanta S., Gr.3. INSPIRITER (Invincible Spirit). 4 wins-1 at 2-at 1200m in GB and France, Fontainebleau Prix Contessina, L, Deauville Prix Etalon Nayef. VANILOQUIO (Acclamation). 7 wins-3 at 2-to 1500m, €177,100, A$92,305, HK$33,250, to 2016-17 in France and Aust, Longchamp Prix Herod, L, 2d Criterium de Maisons-Laffitte, Gr.2. THREE POINTS (Bering). 5 wins-2 at 2-from 1200m to 1600m, £160,439, 540,000fr., Deauville Prix de Meautry, Gr.3, 2d Deauville Prix Maurice de Gheest, Gr.1, 3d Haydock Sprint Cup, Gr.1, Royal Ascot Golden Jubilee S., Gr.1. PRESTO SHINKO (Shinko Forest). 10 wins at 1200m, £193,579, €40,000, Maisons-Laffitte Prix de Ris-Orangis, Gr.3, Doncaster Wentworth S., L, 2d Windsor Leisure S., L, Wentworth S., L.
WAVY RUN (Commanche Run). 12 wins-1 at 2-from 1200m to 1700m in France, U.S.A. and Spain, Golden Gate San Francisco Mile H., Gr.2, Saint-Cloud Prix Edmond Blanc, Gr.3, Prix Altipan, L, Lasarte Premio Gobierno Vasco, L, 2d Chantilly Prix du Point du Jour, L, Evry Prix Phil Drake, L, 3d Hollywood Park American H., Gr.2, Churchill Downs Firecracker H., Gr.3. DUNCAN (Dalakhani). 6 wins from 2000m to 2800m, £229,569, €201,700, Irish St Leger, Gr.1, Yorkshire Cup, Gr.2, Longchamp Prix Foy, Gr.2, Ascot Buckhounds S., L, Epsom City & Suburban H., 2d Royal Ascot Hardwicke S., Gr.2, York Lonsdale Cup, Gr.2, Ascot Buckhounds S., L, Newmarket VK Mojito S., 3d Haydock Rose of Lancaster S., Gr.3, 4th Epsom Coronation Cup, Gr.1, Goodwood Glorious S., Gr.3. GRETCHEN (Galileo). 3 wins at 1½m, 14¾f, Doncaster Park Hill S., Gr.2, Newmarket Chalice S., L.
SAMUEL (Sakhee). 2 wins at 1¾m, 2¼m, £141,089, Doncaster Cup, Gr.2, York Grand Cup, L, 2d York Lonsdale Cup, Gr.2, Goodwood March S., L, Sandown Esher S., L, 3d Yorkshire Cup, Gr.2, Newmarket Bahrain Trophy, L, 4th Sandown Esher S., L.
Race Record: 16 Starts 6-1-3 A$443,045. 6 wins to 1400m, A$443,045, Scone RC Luskin Star S., L, ATC Country Championship Final, Muswellbrook RC Country Championships Wild Card, 3d BRC Victory S., Gr.2, BRC Sprint H., Gr.3, City Tatt's RC Lightning H., L.